Domain jacking at its best....airtel.com forwards to Vodafone !!! Have you ever tried going to airtel.com domain name. If you have not…try it now – The name is forwarded to vodafone website. Yes, it may be a spanish Vodafone website, it still is the competitor’s website ! Nice domain-jacking I must say.. But can’t Airtel lay claim on the domain, I think not. 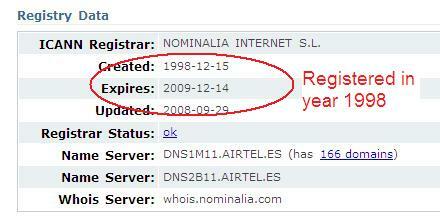 if you see the snapshot above, the domain was registered way back in 1998, probably when airtel was not in existence. Airtel.com is now opening the Airtel’s Global Website. The airtel.com website is that of some singapore(or other foreign country) telecom provider who was acquired by Vodafone. Hence the redirect. This is not domain jacking. well initially i was surprised too but apparently airtel is a comapny in Spain which is owned by the same group which runs Vodafone in spain hence it redirects to their Spanish portal. This has been posted many times by many bloggers in past… may be u just missed it. What I know is, before Hutch buy, Vodafone was investor (around 10%) in Airtel. During that time, vodafone aquired the airtel.com domain name and forwarded it to vodafone. After Hutch buy vodafone was required by law to sell its stock in Airtel as an operator now it can not have stake in competitor. With that, it came to own a competitor’s domain. Seems it is not kind enough to transfer it to Airtel. This is as per my belief… I am not 100% sure though. But yes, .com makes a big difference.